The Crew of MDRS 202 would like to express their gratitude to all the people who made this mission possible: our deepest thanks to Dr. Robert Zubrin, President of the Mars Society; Dr. Shannon Rupert, MDRS Director and Program Manager, who made us feel warmly welcome at MDRS campus; Atila Meszaros, Assistant Director, who for the first time experienced being the only resident manager of MDRS, and performed greatly with our crew; Dr. Peter Detterline, Director of Observatories, who trained and assisted our Crew Astronomer before and during the mission; David Murray, GreenHab Team Lead; Michael Stoltz, The Mars Society Liaison, Media and Public Relations; the Mission Support CapCom who served during our rotation: Sylvain Burdot, Johanna Kollewyn, Andrew Foster, Justin Dingman, Bernard Dubb, Samuel Cadavid, and Makiah Eustice; Purdue MARS, which initiated the crew selection for this mission; all the departments and people at Purdue University who supported this mission; and all the unnamed people who work behind the scene to make this effort possible, and who gave us a chance to be an active part of the effort towards human exploration of Mars. 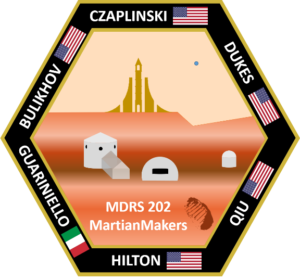 MDRS 202 “MartianMakers” is the second all-Purdue crew at MDRS. This mission had an ambitious plan, and it was greatly successful. All crewmembers performed to the highest standards and provided good work on their research projects, as well as support to projects of the other crewmembers. 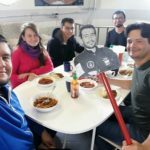 With a little help from meetings and information provided before the mission, the crew adapted to life at MDRS very quickly, and even when tiredness began creeping in, the morale was always high, as demonstrated by a healthy number of smiles and happy faces up to the very last day. As expected, we found out that patience and flexibility are the most helpful qualities in a simulated mission where the crew lives in close quarters for an extended period of time. The research projects that required Extra Vehicular Activities (EVA) provided enough data despite very cold days, and the fresh snow which accumulated twice during the rotation and melted down leaving muddy trails behind. 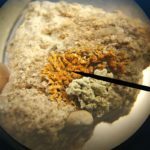 The research described below touched many aspects of human exploration of Mars, ranging from geology, microbiology, astronomy, and potential use of waste to the psychological and social aspects of the mission. 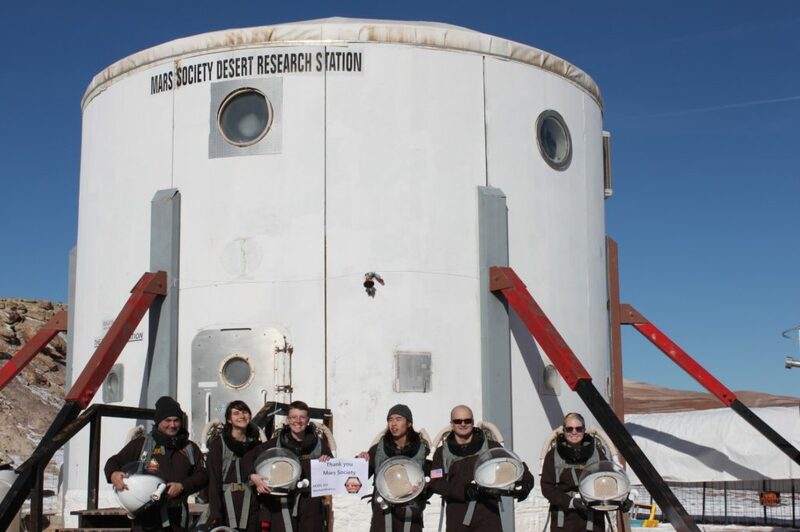 The crew was also involved in various outreach projects, which is an important objective of MDRS. As commander, I am extremely proud of this crew, which was capable to keep the highest level of fidelity and realism in the situation. The crew properly followed safety and research protocols, worked as a tightened group, and in the structured daily schedule was capable to mix long hours of research and exploration activities with personal and team-bonding time. The pace kept throughout the mission was adequate for the objectives proposed in the mission plan, but at the same time slow enough, as expected in a long-term Martian settlement. The crew began preparing their projects long before the mission, collected useful and interesting data during their time and MDRS, and has plans for use of the data after the completion of the mission, as well as ideas for laying foundations for continued collaboration of Purdue crews with the MDRS program and for supporting MDRS with products and manuals for future crews. After being trained in the use of rovers and in the safety protocols for EVA, the crew had twelve excursions during rotation 202, two of which being traditional short EVA to Marble Ritual. 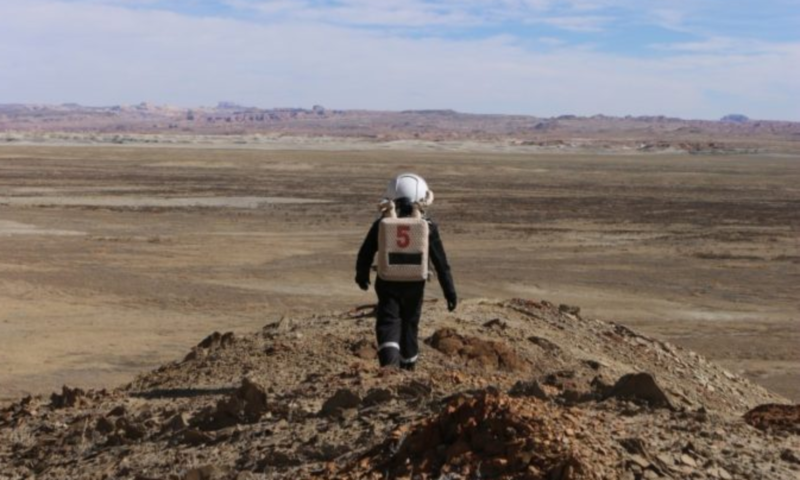 The EVA served four research projects: study of mineralogy and regime of sand dunes, stress levels and decision making, autonomy for crew EVA, and radiological mapping of MDRS. Due to snow in the first days and mud in the last days, the crew could not reach the end of Cactus Rd in the East side, and Skyline Rim in the West side, but explored various areas of interest in the Morrison Formation and Dakota Sandstone. The crew optimized the time on the field, limiting the driving time to 15-25% of the entire EVA duration. Description, activities, and results: The project compares decision-making based on a fuzzy-logic intelligent machine with decision-making by the crew when events occur during EVA. During the longest EVA, the Commander suggested potential events, including failed communications, rover failures, crew injury, unexpected environmental conditions, and asked the crew to describe what they would decide for the rest of the EVA in that situation, and why. For some events, the decision was unanimous (evaluate the criticality of the situation, then proceed), when the perceived risk was low, and the objective of the EVA were not even partially accomplished. Other events entered gray areas, in which the crew at times did not consider the potential risks to exceed the potential gain from continuing the EVA or moving to a secondary objective. In these cases, the decisions of the machine were more conservative. Description, activities, and results: The project evaluates decision-making patterns at different level of stress, including calm conditions, after long EVA, and after the Cold Pressor test. This data will identify potential areas of danger due to misjudgment and faulty decision-making in conditions of stress. All planned data was collected for this experiment, and the first results have been evaluated. Due to a bug in the application used to analyze the data, final results will be available after the end of the mission, with an updated version of the application. 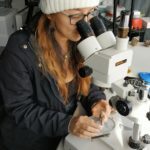 Description, activities, and results: The project studies the evolution of microbial ecosystems in microgreens treated with different types of water, to compare the community structure between different conditions and estimate the possibility that microbes introduced in the environment by astronauts develop any pathogenic strains. 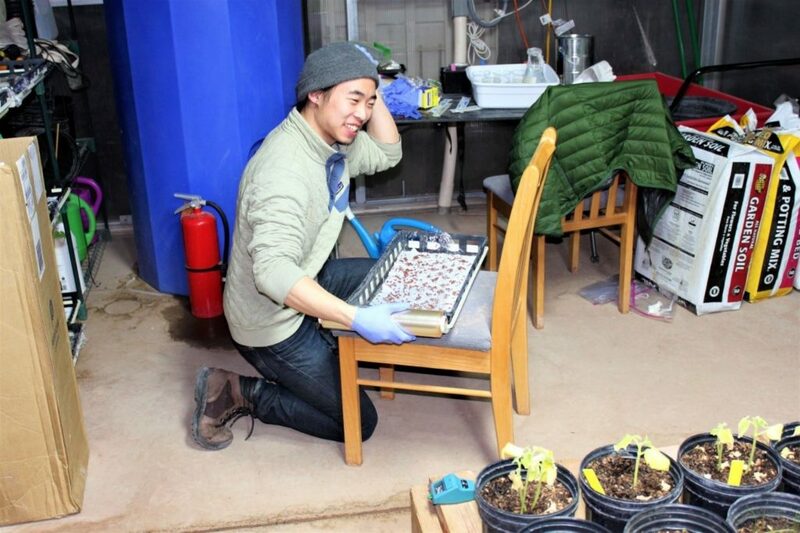 Multiple trays of microgreen were grown, and microbes were studied with a NASA DNA sequencer. Phenotypic properties were evaluated in-situ, while full results on microbial community require post-processing in laboratory that will be executed after the end of the mission. 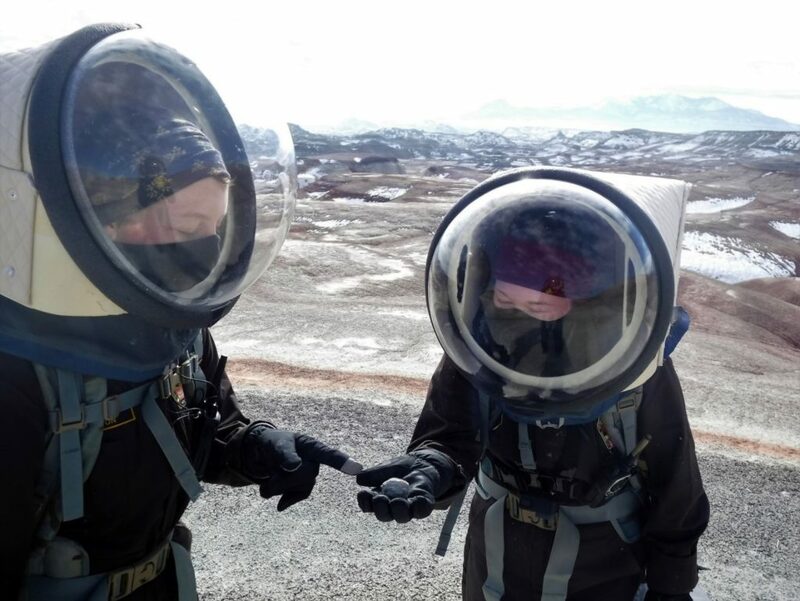 Description, activities, and results: many features in the MDRS area were studied during 10 of the 12 EVA, and sand samples were collected in various locations. 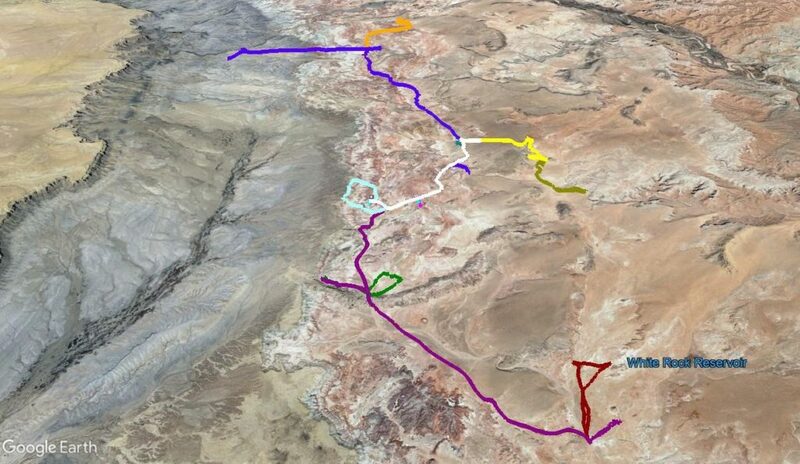 The in-situ portion of the project was completed by collecting visible and near-infrared spectra of more than 90 geological samples in the area, mainly including clays (illite and montmorillonite) and gypsum. The work will proceed after the end of the mission by comparing samples collected in the field with samples taken in laboratory. Description, activities, and results: this project studied the waste produced at the habitat, to evaluate the nitrogen and carbon content. This is very important when planning to use the waste to create a compost pile, which would provide a way for waste to be reused and provide plants with nutrients. A healthy compost requires a 1:25 ratio of nitrogen-rich to carbon-rich waste. Human waste can be used to modify the ratio towards carbon-richer compost, therefore an anonymous journal of human waste production has been kept, in order to evaluate the amount of compost that could be produced. Due to the lack of carbon-rich waste and to the large amount of food, which is nitrogen-rich, the waste produced at the habitat resulted highly nitrogen-rich and would require human waste added to modify the ratio of nitrogen to carbon. 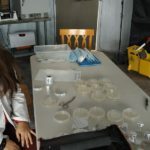 Description, activities, and results: Questions of interest about MDRS and living on Mars were prepared for the crew. Each crew member was videotaped answering the questions in a “73 questions” Vogue format, and the videos will be used for outreach after the end of the mission. 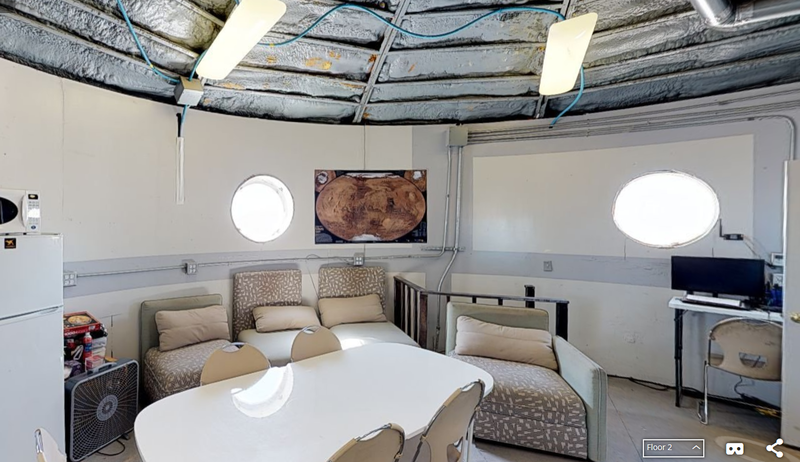 Description, activities, and results: with the support of Dr. Peter Detterline and Dr. Shannon Rupert, the Crew Astronomer and Atila Meszaros helped improving the focus of the MDRS-WF telescope. In the months preceding the mission and during the mission itself, the Crew Astronomer captured and processed images of various deep-space objects, including M1, M31, M33, M42, M51, M78, IC405, the Rosette Nebula, the Horsehead Nebula, the Rosette Nebula, and comet C46P/Wirtanen. The images will be used for outreach and education. 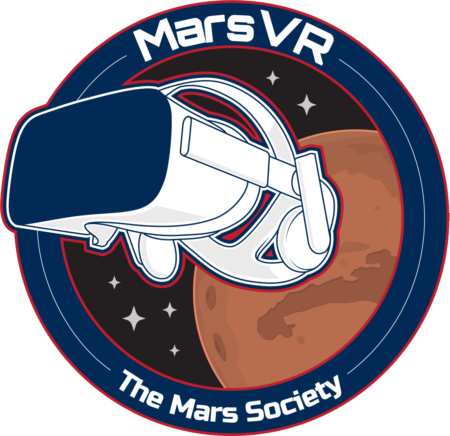 Description, activities, and results: Addressing the problem of radiation on Mars, this project simulated a possible activity that astronaut will perform on the surface of Mars, and ambient radiation readings were collected in 32 different points around MDRS. The levels were between 10 μR/h around Cactus Rd and 30 μR/h around Kissing Camel Ridge. However, one location on the southern wall of Lith Canyon had a reading of 127 μR/h, possibly due to the presence of fossilized remains in the area. A map of MDRS with associated ambient radiation levels will be produced after the end of the mission. 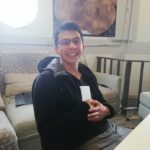 Description, activities, and results: The ongoing project is producing descriptions of the research performed by members of MDRS 202 aimed at different levels: K-6, 7-12, and college. 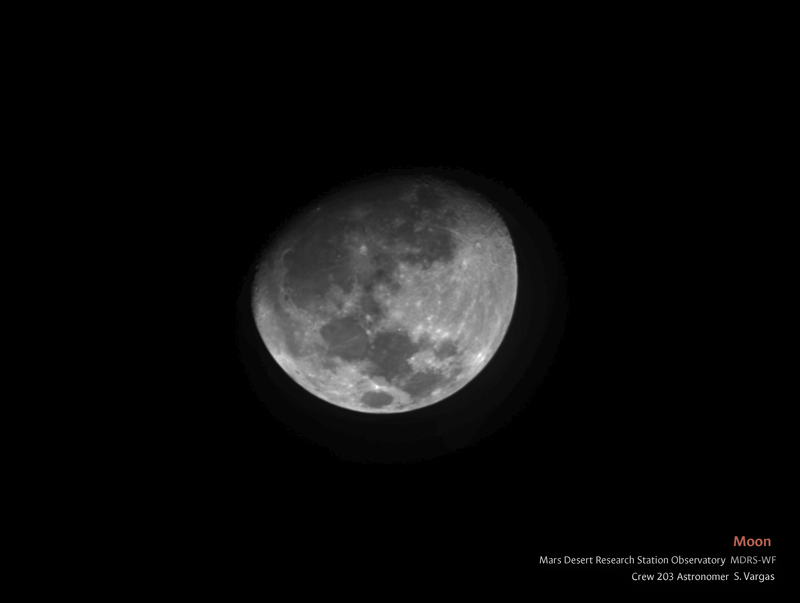 Description, activities, and results: this project used the MDRS-14 telescope before the beginning of the mission, to evaluate the photometry of Pluto and Makemake. 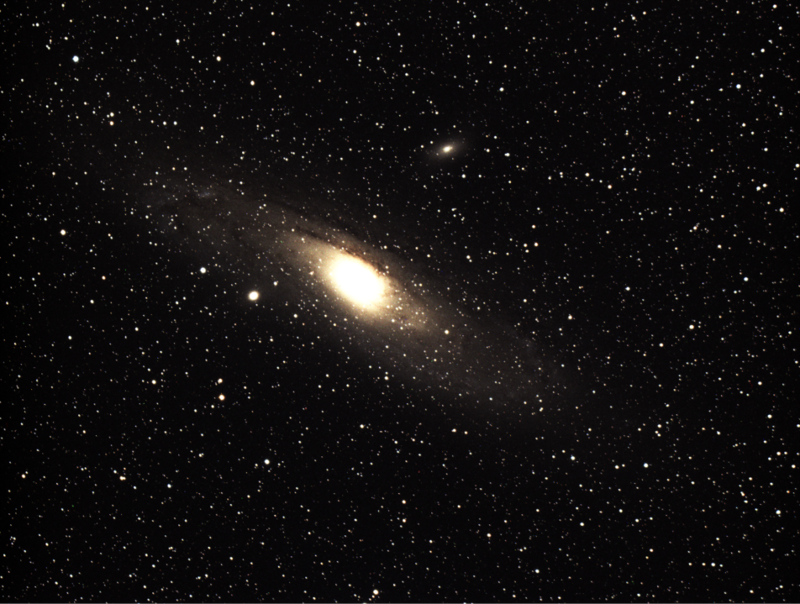 Due to weather conditions and some remaining problem with the centering of the telescope, preference went to imaging with the MDRS-WF telescope, and more photometry will be performed after the end of the mission. Today begins with the departure of the Queen of Mars and the arrival of our crew astronomer, which arrived thin and pale, even though he always looks serious, now we do not have the feeling that someone is missing in the hab. The day goes with some science, maintenance of the station, a puzzle that invades our dining table and knowing that we are already in the third quarter of sim. The feared third quarter of sim arrives and the tiredness is felt, however, today the crew received a gift from our commander to renew our motivations, with messages that remind us that we have someone on the Earth waiting for us and that we are the pride of many people. The tears of today remind us that this time we do not only have robots on Mars, we also have humans and, therefore, the challenges of space exploration are not only technical. No matter how many times we come to Mars we will always learn something new and we continue to be amazed. I want this journalist to be another message for my colleagues, I want to know that it is an honor to work with you, that your relatives have reasons to be proud of you and that I have learned a lot from you. I do not know if you have learned something from me, for now I am happy to steal some of your laughs, even with the help of the most ridiculous card game in the world (Thanks Cristy Clarke). El día de hoy empieza con la partida de la reina de Marte y la llegada de nuestro crew astronomer, el cual llegó algo flaco y pálido, a pesar de que parece siempre estar serio ya no tenemos la sensación en el habitad de que alguien falta. El día transcurre con algo de ciencia, mantenimiento de la estación, un rompecabezas que invade nuestro comedor y sabiendo que ya estamos en el tercer cuarto de simulación. El temido tercer cuarto de simulación llega y el cansancio ya se siente, sin embargo, hoy la crew recibió un regalo de nuestro comandante para renovar nuestras motivaciones, con mensajes que nos recuerdan que tenemos a alguien en tierra esperándonos y que somos el orgullo de muchas personas. Las lágrimas de hoy nos recuerdan que esta vez no solo tenemos robots en Marte, también tenemos humanos y, por consiguiente, los retos de la exploración espacial no son solo técnicos. No importa las veces que vengamos a Marte siempre aprenderemos algo nuevo y nos seguimos maravillando. Quiero que este Journalist report sea otro mensaje para mis compañeros, quiero sepan que es un honor trabajar con ustedes, que sus familiares tienen razones para estar orgullosos de ustedes y que he aprendido mucho de ustedes. No sé si he logrado que aprendan algo de mí, por ahora me conformo con lograr robarles algunas risas, así sea con la ayuda del juego de cartas más ridículo del mundo (Gracias Cristy Clarke). After having performed 3 EVA for data collection of geology and microbiology, the crew began their activities in the science dome. 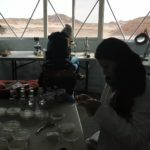 Characterizing the collected rocks, organizing the collected data for photogrammetry and processing the microbiological samples of surfaces collected at the station. The experiments in the greenhab also started 2 days ago. The crew made different mixtures of soil and regolith to plant peas. The objective of this project is to determine the viability in gemination of the crops.Tests are being conducted in the greenhab to determine the percentage of oxygen and the incidence of this in crops. The lysimeter is assembled and the container for planting must be adapted. Two daily reports of the ethnographic study are being sent. Sol Activity Summary: The day started with some exercise from 4 crewmembers. We then went to the upper deck and had breakfast, and then a team of 4 prepared for their EVA. They went to Tank Wash to perform more geology and microbiology. They returned to the hab to a cup of hot chocolate, rested a bit, and started to work on their respective reports. We plan to have another night talking about our plans for the future. Look Ahead Plan: having passed the first half of our rotation, we expect to start to finalize each project. We’ve made plans for the food of the rest of the rotation, and are planning to spend the night watching a movie. Weather: Clear skies all day long, very sunny. Moderate presence of cirrus. EVA: 1, a team of 4 went to Tank Wash for scientific survey. Reports to be filed: Sol Summary, Operations Report, Greenhab Report, Journalist Report, EVA Report, HSO Report.